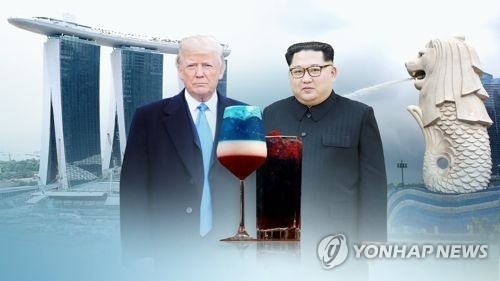 SEOUL, June 7 (Yonhap) -- World powers are jostling for influence over the Korean Peninsula ahead of next week's summit between U.S. President Donald Trump and North Korean leader Kim Jong-un, which is expected to mark a shift in Northeast Asian geopolitics and security. In the lead-up to the historic summit set to be held in Singapore next Tuesday, China, Russia and Japan have been beefing up diplomacy with the reclusive state, in an indication that Pyongyang, once an incorrigible outcast, has emerged as a player of geostrategic significance. 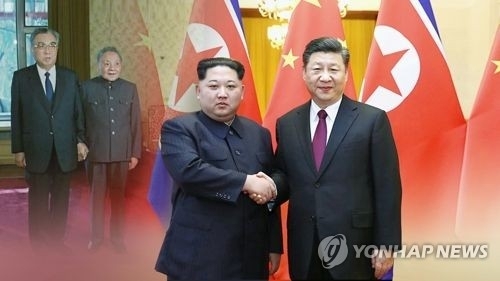 The summit is expected to center on addressing the deep-seated enmity between the longtime foes and the North's nuclear disarmament, which could set the stage for full-fledged talks on crafting a peace regime on the peninsula -- a process that may involve regional powers. In recent months, China has been seen scurrying to court its traditional ally, the North, in a marked shift from years of arm's-length diplomacy, through surprise summit meetings in March and May. The move came after a period of worsening distrust between Beijing and Pyongyang that was triggered amid the absence of top-level contacts and the Asian major power's participation in U.S.-led international sanctions. A wake-up call for Beijing was the April 27 inter-Korean summit declaration in which South Korean President Moon Jae-in and Kim agreed to seek a formal end to the 1950-53 Korean War, possibly through a three-way summit that excludes China. Amid talk of China possibly being sidelined in a peninsular peace process, Beijing's foreign ministry stated that it would play a "suitable" role as a signatory to the Armistice Agreement, which halted the Korean War, but left the two Koreas technically at war. "China may feel wary as the two Koreas and the United States have mentioned a three-way meeting while not talking about China's role or participation," Suh Jin-young, professor emeritus at Korea University, told Yonhap News Agency. "China would remain fidgety if the three parties discuss a peace treaty issue among them, with its role possibly being reduced," he added. After taking power as president in 2013, the Chinese leader undertook an unusually tough stance on the North's provocations, including nuclear and missile tests, amid U.S. calls to act as a "responsible regional stakeholder" and a growing sense within China that its wayward ally was becoming a strategic liability rather than an asset. Xi was instead seen striving to enhance ties with the South, triggering speculation that Beijing has recalibrated its strategic calculus towards Pyongyang and started to maintain "equal distance" with the two Koreas. But after the North's charm offensive that played out in earnest during sports diplomacy earlier this year, Beijing was seen readjusting its approach to Pyongyang and appeared intent on improving ties with its ally. Despite years of estrangement, China has long viewed the North as a strategic buffer state that would help prevent an unpalatable scenario -- the advance of an American military footprint from the South all the way to the peninsula's border with China. China's recent diplomatic efforts paid off as evidenced by statements from the leaders. In the May summit, the North Korean leader noted that the relationship between Pyongyang and Beijing is becoming one that is inseparable, while his Chinese counterpart mentioned the bilateral ties as being as close as "lips and teeth." "In the coming years and beyond, China will find it difficult to underestimate the strategic value of the North," Suh of Korea University said. Russia has also been ramping up diplomacy in an apparent move to have a greater say in the shifting contours of geopolitics on the peninsula. It has invited North Korean leader Kim to attend the annual Eastern Economic Forum slated for September in Vladivostok, and recently sent its Foreign Minister Sergei Lavrov to Pyongyang for talks with Kim and other top officials. During the talks in the North Korean capital, Lavrov discussed a range of issues, including launching trilateral projects between the two Koreas and Russia to link their railway networks and to build a gas pipeline. Moscow's outreach to Pyongyang appears aimed in part at helping catalyze its "New Eastern Policy," an Asia-centric policy initiative to pursue balanced regional development, cement ties with the Asia-Pacific, which is now a fulcrum of global power and wealth, and diversify its energy export routs. "In light of economic interests, Russia may want to join hands with the two Koreas to expedite its New Eastern Policy as it feels the growing need to develop its Far East region and bolster cooperation with Asian countries under the initiative," said Chang Duck-joon, a Russia expert at Kookmin University. "In addition, Moscow, along with Beijing, appears to have the strategic calculation to maintain influence over the peninsula to curb or check the growing hegemonic influence of the United States in the region," he added. Japan's growing wariness has also been palpable, as media and experts have highlighted its absence in a flurry of top-level dialogue involving the North. Japanese Prime Minister Shinzo Abe is set to meet Trump before the Singapore summit next week, apparently to address several of Tokyo's concerns, including the optics of it being sidelined in ongoing diplomacy with Pyongyang. One major concern for Tokyo is the possibility that Trump, in his talks with Kim, could settle for an agreement that may not address its long-standing security concern -- the North's short- or medium-range ballistic missiles that target the island country. Observers said that Japan has also been unnerved by Trump's apparent easing of his hitherto tough stance on the North. After meeting with a top North Korean official in the Oval Office last week, Trump said he would not even use the term "maximum pressure," a campaign to pressure Pyongyang through economic sanctions, diplomatic isolation and military threats. "One of the most sensitive issues is the speculation that Trump would try to address the North's intercontinental ballistic missiles (ICBMs) in consideration of domestic political interests while not addressing the mid-range missile threat," Nam Chang-hee, security professor at Inha University, said. "It may also be embarrassing for Abe to see the U.S.-Japan alliance being decoupled over the issue of pressuring the North as Trump talked of the possibility of desisting from the pressure campaign," he added, noting that Abe's political capital has in large part stemmed from his hard-line stance on the North. The North's professed completion of the ICBM program has prompted Washington to crank up diplomacy with Pyongyang, as the long-range missile poses a direct threat to the continental U.S. and could weaken the credibility of America's security commitment to its Asian allies. Pyongyang's ICBM is seen as a formidable weapons system to keep U.S. troops at bay and thus undercut America's regional alliance network. 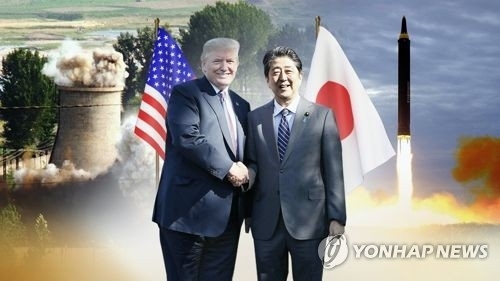 Japan is likely to gain some diplomatic leverage over the North if the two sides hold talks over the normalization of bilateral ties, which the communist state has long eyed with the apparent goal of securing compensation for Tokyo's 1910-45 colonial rule, analysts said.